We woke up about 6 a.m. on a Sunday, packed and ready to go. We bathed, ate toast and drank a cup of tea. A friend of my son Josh and a nice lady picked us up in their car for the trip down to Tampa airport. I had a wonderful conversation with the woman. After they dropped us off they were going to the St. Petersburg Museum of Art to see the exhibit on Star Wars costumes. As we were taking our bags out of his trunk I told Josh’s friend that his wife was delightful to talk to. As we walked into the Amelia Earhart door, I hoped the rest of the trip would be less embarrassing. We sat there for the next hour waiting for the rest of our group to show up. I had weaseled our way on a school group tour. We pretended to be chaperones to get a really good price on tickets. My teacher friend who had gotten us on the plane arrived so we started following her around like we were little puppies. Once we were told which gate we’d be departing from, I asked Josh to get us something to eat. He came back with delicious hamburgers. They were dripping with grease just like the good old days in the fifties and sixties. We were finally off to Newark where we had a four-hour layover before our five-hour flight to Shannon Airport. It was during this leg of the journey I began to feel a bit queasy which I wrote off to turbulence. We arrived in Ireland at 6 p.m. which suddenly became noon because we were traveling into the sunrise. Josh and I posed for some silly pictures, and my stomach was still grumbling. I hadn’t felt this bad since that Ronald Reagan film festival. (Extra points if you catch the movie reference.) 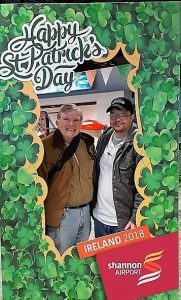 The professional tour guides who met us at the Shannon airport said we’d get over the jet lag faster if we spent the next six hours sightseeing before checking into the hotel, eating and going to bed. Our first stop was the most perfectly preserved ruin in Ireland, Bunratty Castle. I was very impressed. It was a tall stone sonofabitch. When we first entered the courtyard we became immediately aware of the clatter of sheep bleating and crows cawing. In their own way they were quite charming. 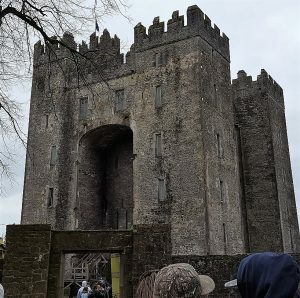 As we started up the hill to the castle gate, my stomach stopped feeling queasy and went into four-alarm revolt over that damn greasy hamburger. I turned off the path, tried to hide behind some bushes which had yet begun its spring foliage and proceeded with a nasty case of the dry heaves. While everyone else climbed the castle steps, I hurried back to the visitor center to find the nearest toilet. Thank goodness it was exquisitely clean. Eventually I felt better, made it up the castle steps to the main dining hall where the group was hearing a lecture about how awful life was during the Middle Ages. The docent went into particular detail about how narrow, steep and irregular the stairs were. All the better to make the assaulting forces to lose their balance and fall back on themselves. He then invited us to climb another round of godforsaken steps to see the impressive landscape from the battlements. I had to go back to the gift shop immediately to find another toilet. The second was as clean as the first and I wretched again, hoping this would be the last sick spell of the trip. We all got on the bus for a trip to Adair, a quaint thatched-roof village, where we were to have lunch. The thought of food made my stomach growl again, but the tour guide suggest fresh mint tea to settle the tummy. She was right, and the tea with freshly crushed mint was soothing. But Josh—who, by the way, has a cast-iron stomach–ordered a breakfast of runny eggs and greasy sausages, the sight of which sent me to the little restaurant’s toilet. Fortunately it also was immaculately clean. 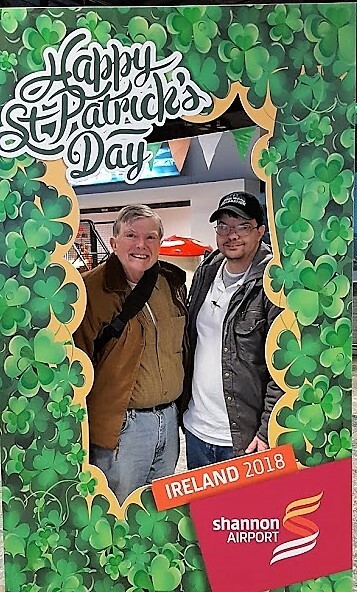 When I came to Ireland I thought I’d have a wonderful time with the wearin’ o’ the green. Instead it turned into the clutchin’ o’ the porcelain. For our last tourist foray of the day we went in search of authentic live Irish music in an authentic Irish pub in downtown Killarney, which was really, really charming. 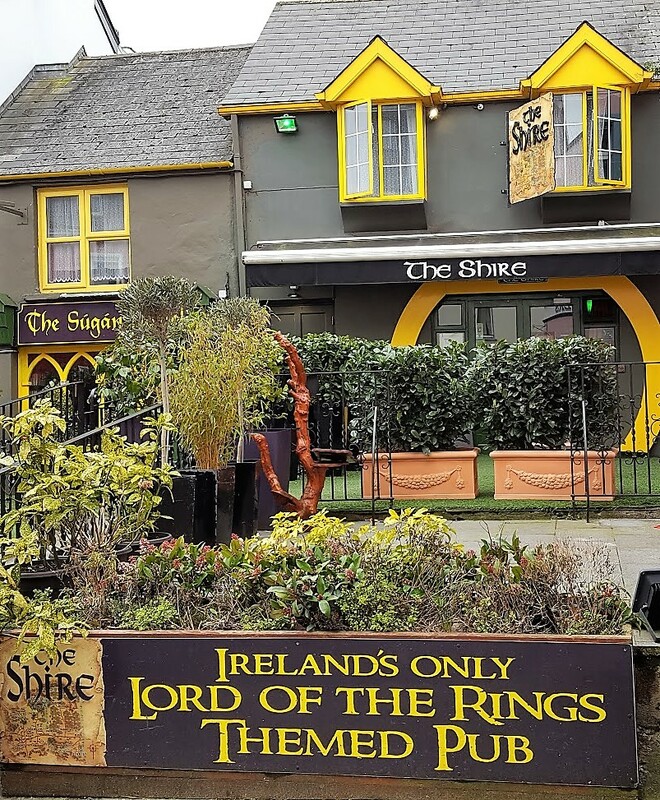 It had a pub which claimed to be Ireland’s only Lord of the Rings themed pub. Cute but not really charming. I found another nice cup of mint tea and watched all the lovely natives enjoy their afternoon among friends. Nothing related to Lord of the Rings. My initial intention was to forego dinner at the hotel. Since I had already paid for the food, I went downstairs just to say hello to it. On the plate was a nice slice of roasted turkey with mildly seasoned dressing. After bolstering my constitution with another cup of mint tea, I nibbled away at the turkey and dressing. 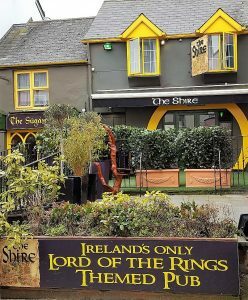 By the time I finally made it to bed, my mind could not figure out how many hours it had been awake, but my stomach had decided to like Ireland after all. 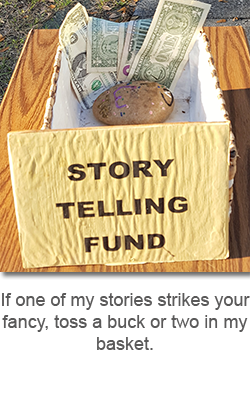 This entry was posted in Stories on April 5, 2018 by jerrycowling.